Activists claiming to be members of the MDC have demanded an urgent elective congress to choose a new party leader, claiming that incumbent Nelson Chamisa's hold on power is unconstitutional. Calling themselves the 'Defending MDC Tsvangirai Legacy (DMTL)' group, the activists called a press conference in Harare last week where they accused Chamisa of dictatorship. 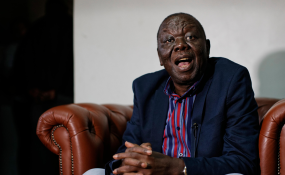 The 40-year-old's elevation was backed by the MDC's national executive and the national council; the latter being the supreme decision-making organ between congresses. "The fundamental right of members of this party to choose their own leaders and to stand to be elected for any party position should be respected without negotiation," said the group's information officer Weber Chinyadza. "Further, the current process to bastardise elective structures for the congress in order to ensure the election of a preferred candidate should be abolished. "In any event, the constitution of the party is very clear on the timetable for any congress especially after the passing on of an incumbent president. "No one should be allowed to, willy-nilly, change those provisions for the purposes of self-aggrandisement." "I was supposed to run for Goromonzi West MP, but Chamisa held a rally a week before the elections advising constituents to vote for Luke Tamborinyoka resulted in Energy Mutodi winning Zanu PF winning the seat," said another DMTL activist Clifford Nyamburo. Chinyadza added; "We are not blind to the fact that the MDC has been besieged by an unelected leadership which is consciously and persistently using very undemocratic practises to lead the organisation. "It is in the public domain that this self-imposed leadership has blocked the people's right to elect their own leaders and has unashamedly left one person to appoint and co-opt his own cronies into the party leadership, a custom well-orchestrated in ZANU PF."